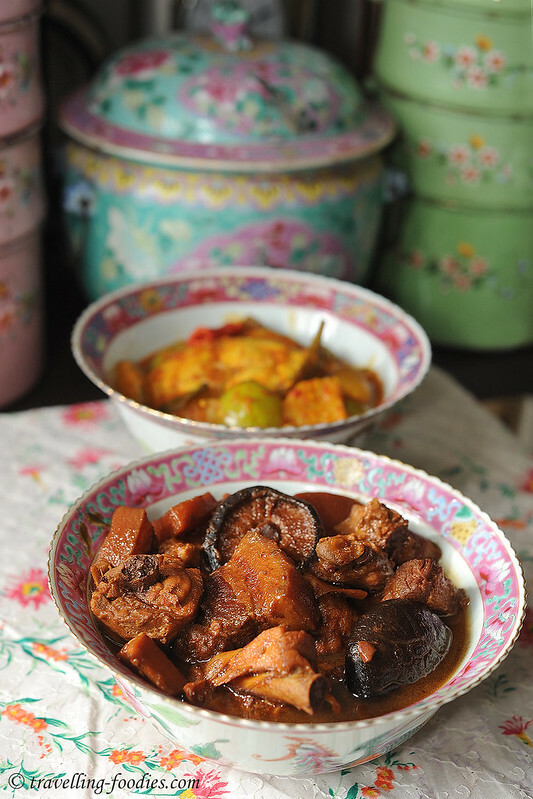 Babi Ayam Pongteh is very old-school cooking from the Peranakan home. It usually manifests as the pork, or the chicken version and never quite the both of them together. But then, their flavours compliment each other very well. If pork bones and an old hen are the quintessential ingredients to good stock making in Chinese cuisine, I don’t see why it cannot be extended to this dish as well! 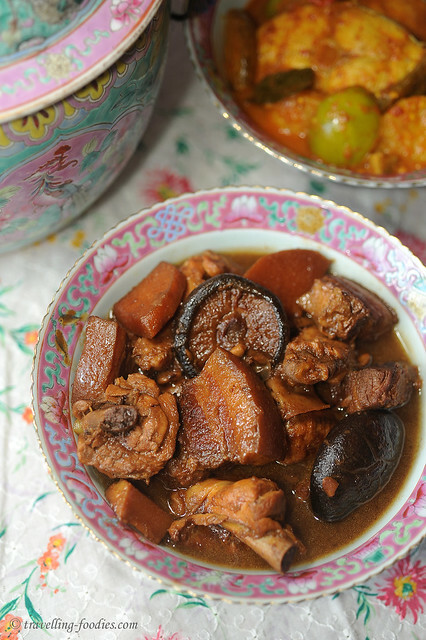 Babi Ayam Pongteh is really “Death by Taucheo“, probably the only dish that calls for much preserved soya bean paste to be used in a single seating. I didn’t pound the tau cheo until a fine paste, but instead I merely crushed them with the back of a fork to release the flavours before adding to the shallot/garlic mixture. For a more earthy tone, I’d used gula melaka in place of the usually rock sugar. 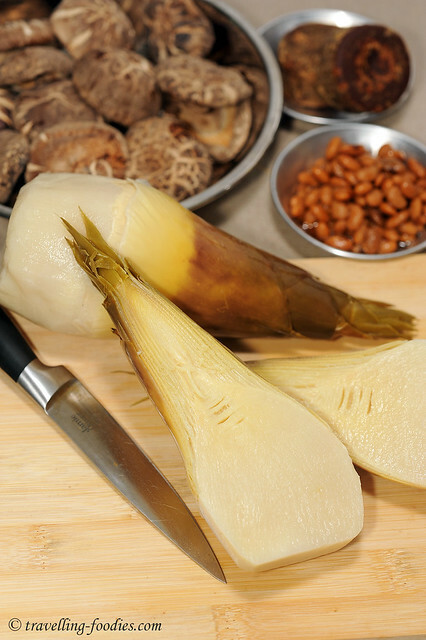 Bamboo shoot wise, the green variety from Taiwan. Otherwise, canned bamboo shoot works really well too according to Violet Oon since bamboo shoot needs to be parboiled in water anyway. 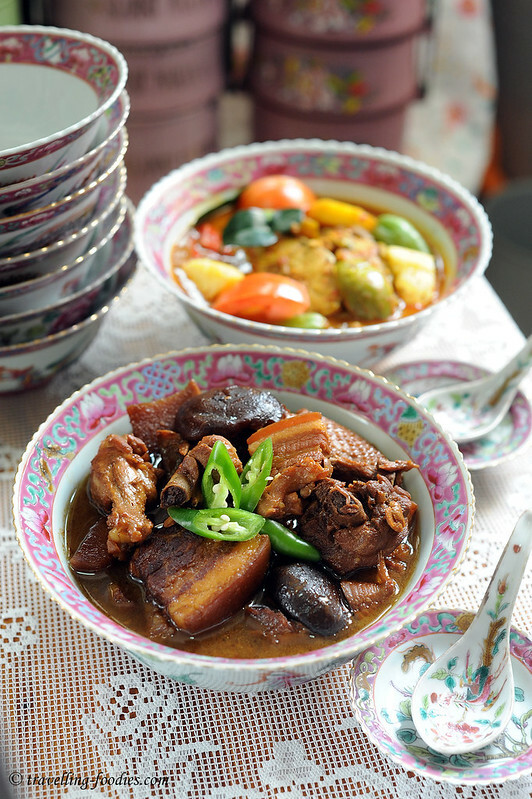 And I can attest to that as the Babi Pongteh served at her bistro is really quite delicious! Potato, which I did not use this time round, can also be added. I’d also added tau kee (dried bean curd sticks) before to soak up all the flavour. Very very good with porridge. Dark soya sauce added do not merely provide colour but has a part to play in improving the flavour of the dish. So do use a good dark and thick soya sauce. It is the a pronounced soya flavour and fragrance (酱香) we are after and not just saltiness which would make it rather flat (死咸). Taucheo is very salty on its own so the dish doesn’t really require any salt. However, in the event when seasoning is indeed required, use the brining liquids of the taucheo instead of adding salt directly . The two types of meat require very different cooking time. Logically, pork is first braised at least 40 min to an hour, before chicken is added during the last 30 min. Or you can do it like what I did, i.e. cook the pork belly first and steeped the pieces in gravy overnight. 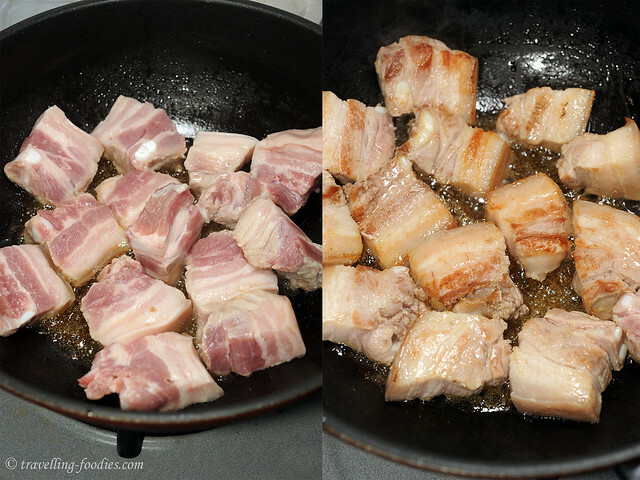 On the next day, remove the chunks of pork, add chopped chicken pieces and cook for 20-25 min or so, and return the pork belly to the wok with the chicken and cook together under medium low heat for the last 10-15 min until both are deliciously tender. This helps to ensure that the pork has thoroughly absorbed all the richness from the sauce while preventing the chicken from disintegrating due to overcooking. Given time to mature and develop, the flavours of the dish could really improve significantly. But in our modern homes today, amidst all the technology and gadgetry to aid us in our meal preparation, time is really the one key ingredient, not unlike the tangibles, which is severely lacking. 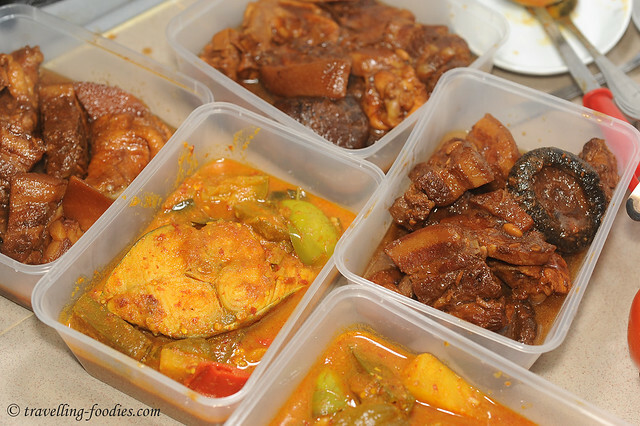 Packing some for friends… food is afterall, all about sharing! 1. Blend or pound shallots and garlic into a thick paste. 2. Crush tau cheo with the back of a fork and set aside. 3. Pat dry pork chunks with kitchen towel to rid them of excess moisture. 4. Add oil to wok over medium heat. Lay pork chunks over oil carefully and brown meat on all sides. Do in 2-3 batches depending on size of wok to prevent overcrowding. 5. 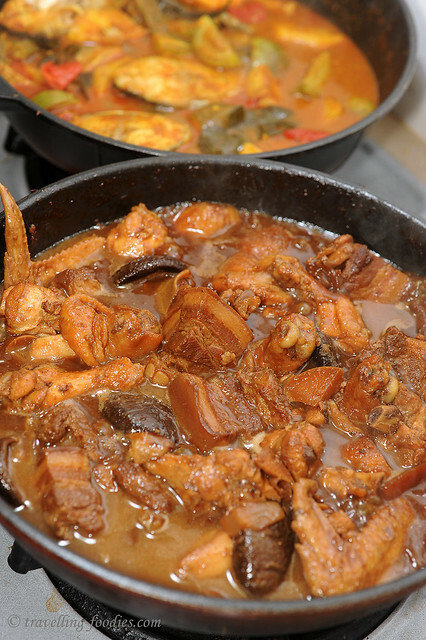 Remove pork from wok and set aside in a plate. 6. Add shallots and garlic mixture in (1) and stir-fry over oil until fragrant and transluscent. Ensure that the shallots are thoroughly caramelised and somewhat dry. 7. Add crushed taucheo and stir-fry to mix well. 8. Return pork chunks to wok and chinese mushroom. 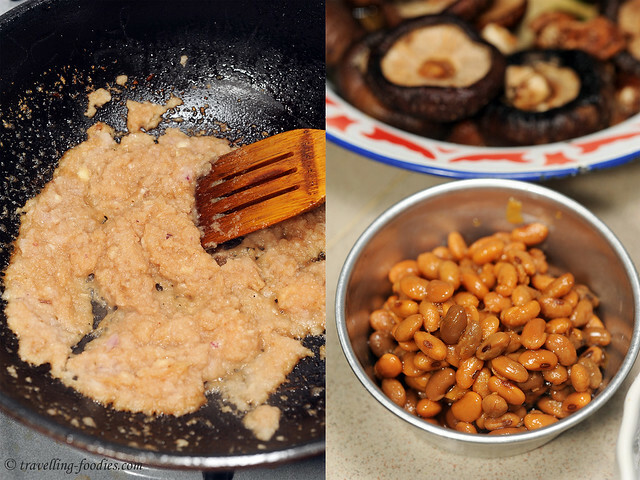 Add dark soya sauce. Stir-fry for a min or so until all the pork chunks are well coated. 9. Add water to the wok until it completely covers all the ingredients. Add bamboo shoot. 10. Bring the flame up for the ingredients to come to a rolling boil. Add gula melaka. Lower flame to a simmer for 40 min to an hour or so covered. Using a spatula, etch the base to remove any caramelised bits to help in deglazing. 11. Add chicken pieces and continue to cook for another half an hour until chicken is completely tender. 12. Garnish with slices of green chilli and serve immediately with piping hot rice. This entry was posted on February 28, 2013 by Alan (travellingfoodies). 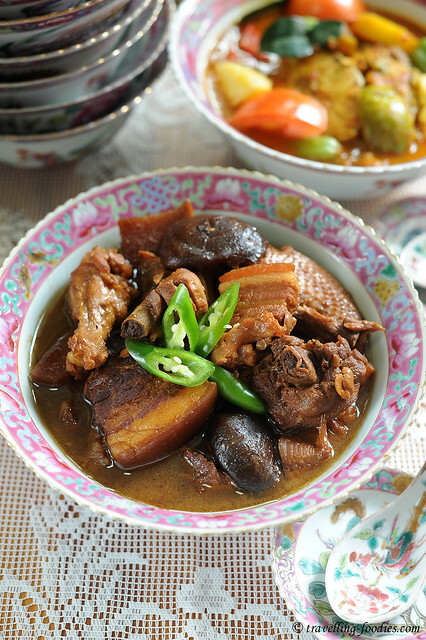 It was filed under Food, Simple Eats and was tagged with Baba, Babi Ayam Pongteh, bamboo shoot, chicken, chinese mushroom, Nonya, Nyonya, Peranakan, pork belly, preserved soy bean paste, straits chinese, tau cheo. Wow Alan! I’m really impressed! You sure know how to cook! Hi Alan, may I know where to buy the tau cheo? What brand? Thank you for sharing!